Born in 1923, Al Del Vecchio was the longest serving mayor. He served 4 terms, from 1976 to 1993. WHITE PLAINS, NY (September 2018) – The Westchester County Industrial Development Agency (IDA) approved on September 27 a resolution of intent to provide financial incentives for a $203 million mixed-use residential development located at 440 Hamilton Avenue in downtown White Plains. The development involves the adaptive reuse of a 12-story office building formerly occupied by AT&T at 440 Hamilton Avenue to allow for construction of 255 apartment units and 2,420 square feet of commercial retail space for a green grocer. The plan also calls for developing an adjacent surface parking lot on Barker Avenue with a tiered 6- and 7-story apartment building with 213 units together with parking for the project’s residents and associated retail space. Six percent of the units will be affordable at 60% of Westchester County Area Median Income (AMI). Market rate monthly rents are projected to be $2,000-$2,300 for a studio, $2,400-$2,600 for a 1-bedroom unit and $2,600-$3,000 for a 2-bedroom unit. 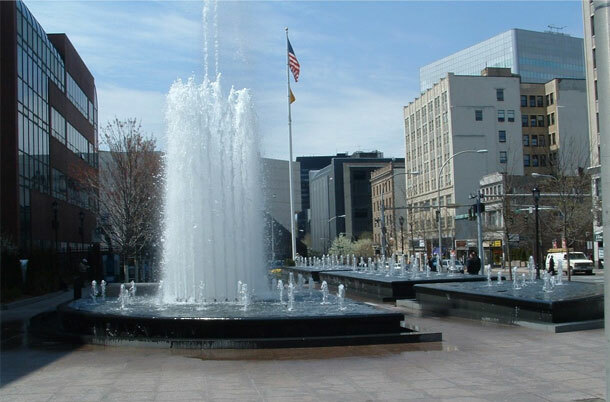 The project is located a short walk to the White Plains Metro-North train station. Estimated IDA benefits include $3,335,400 in sales tax exemption and $1,685,630 in mortgage recording tax exemption for a total tax abatement of $5,021,030. The development is expected to create 659 construction jobs and 31 permanent jobs over a period of 24-28 months. The developer is Rose Associates of New York City. 440 Hamilton Avenue will incorporate green building technologies including LED lighting throughout, electric car charging stations, bicycle storage room, green cleaning practices, low-flow kitchen and bathroom features, Energy Star rated appliances and a building envelope that exceeds NYS Energy Code. “This project is an excellent example of the type of innovative adaptive reuse development that the IDA is interested in providing financial incentives. The IDA is focused on making the county more appealing to new young talent. Updating commercial properties such as 440 Hamilton Avenue with new housing that is easily accessible to Metro-North train service is an important part of that focus,” said Bridget Gibbons, Deputy Director of the Westchester County Office of Economic Development. Lake George, NY—August 5, 2018—Adirondack Archangels: Guardians of the High Peaks, by Christine Bourjade and Alex Radmanovich of New Russia, NY, and Montreal, Quebec, has been named by the Independent Book Publishing Professionals Group as one of the best indie books of 2018. The book is published by ADK (Adirondack Mountain Club). Bourjade and Radmanovich’s book was cited as a finalist in the Environment category in the 2018 Next Generation Indie Book Awards, a book awards program for independent publishers and self-published authors. The awards are judged by leaders of the indie book publishing industry, including many with long careers at major publishing houses. Their love of a great read and experience in the publishing arena identify books deserving a wider audience. Adirondack Archangels is a collection of essays by and about individuals who have worked to protect the Adirondack Park and its highest peaks. It is a tribute to the late Edwin H. “Ketch” Ketchledge, Ph.D., who in 1989 led the creation of the High Peaks Summit Stewardship Program. The book comprises thirty-nine essays and includes a foreword by celebrated writer Bill McKibben and over 250 photographs. All proceeds from Adirondack Archangels go to support the High Peaks Summit Stewardship Program. One of the most successful environmental programs in the Northeast, the Summit Stewardship Program focuses on educating hikers, protecting and monitoring the alpine summits, and training the next generation of environmental stewards. The program is a partnership of ADK, the Adirondack Chapter of the Nature Conservancy, and the New York State Department of Environmental Conservation. Adirondack Archangels is 304 pages, 6″ x 9″, and includes over 250 color and black and white photos, some of which are archival images. It is available in softcover for $24.95 at book and outdoor supply stores, at ADK stores in Lake George and Lake Placid, through mail order by calling (800) 395-8080, or online at www.adk.org. 2018 is the 11th year of the book awards program. Catherine Goulet, Co-Chair of the Next Generation Indie Book Awards, notes, “Our program has become known as the Sundance of the book publishing world.” A complete list of 2018 winners and finalists is available at the Next Generation Indie Book Awards website at www.indiebookawards.com. 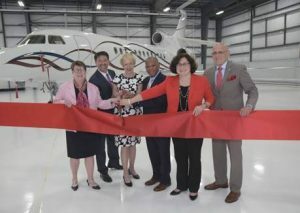 WEST HARRISON, NY (May 2, 2018) – County and local officials today joined with executives from Million Air to celebrate the grand opening of Million Air’s new state-of-the-art hangar at its corporate aviation complex at Westchester County Airport. The 52,000-square-foot hangar is part of Million Air’s $80 million expansion and upgrade at the airport. The two-story hangar features 28-foot height doors capable of housing a Gulfstream 650, which is Gulfstream’s largest business jet. Floors are heated with a high-tech radiant heat system that allows temperatures to be maintained for aircraft and pilots. The new hangar also includes eight customizable offices with storage space. With the completion of the new hangar, Million Air’s complex now has 84,000 square feet of hangar space and 7.25 acres of ramp space. Construction is currently under way on a new 18,000-square-foot terminal. Located adjacent to the new hangar, the two-story Adirondack-styled terminal is luxuriously designed with a resort-style ambiance including elegant seating areas, wood and rock features, stone framed dual fireplaces and wood beam ceilings. The new terminal will feature conference rooms, pilot lounge with sleep rooms, barista staffed grand coffee bar, climate controlled indoor valet area and additional parking. The new terminal is expected be completed by the end of this year. In May 2016, the Westchester County Board of Legislators approved a 30-year lease with Million Air, granting improvements of the company’s Fixed Base Operation facilities on the 26-acre property at Westchester County Airport. In October 2016, the Westchester County Industrial Development Agency (IDA) approved issuing tax-exempt bonds for Million Air, which lowered the project’s financing costs. and floods have devastated island and coastlines. Why don’t we have some large cruise ships come into places like Puerto Rico and other tropical islands and house thousands of people until reconstruction of infrastructure can be completed. This would be an immediate interim solution–an obviously temporary measure. starting at accommodating 500 to 1000 people and going to as large as 5000 to 6000 people. normal lifestyle as quickly as possible.This kind of program will require extensive evaluation. We are dealing with catastrophic events involving millions of people and we need to do something.